It’s an office building, it’s a highway ramp, it’s… well, the Gate Tower Building is a little bit of both. 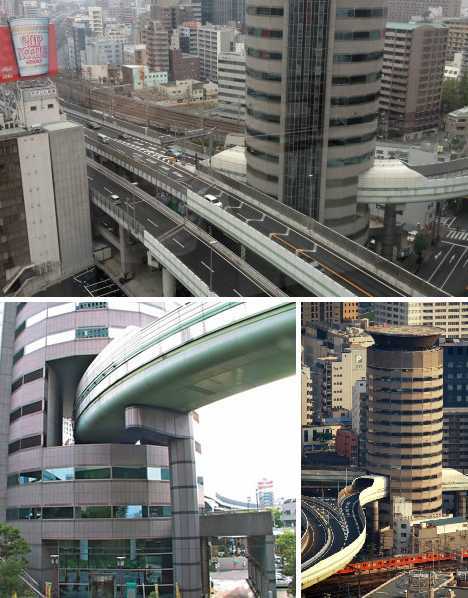 The Osaka, Japan landmark sometimes called “The Beehive” looks like some future extrapolation of supersaturated city life but in actuality the building/highway combo was opened nearly 20 years ago in February of 1992. 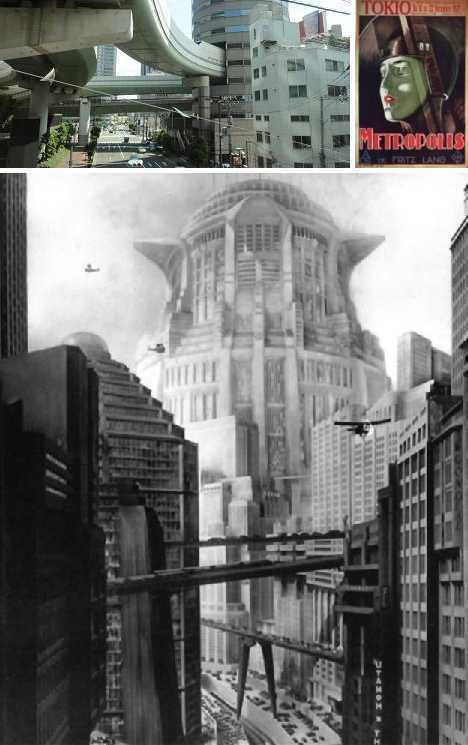 The process which led to this curious urban hybrid dates back almost a decade earlier, to 1983. 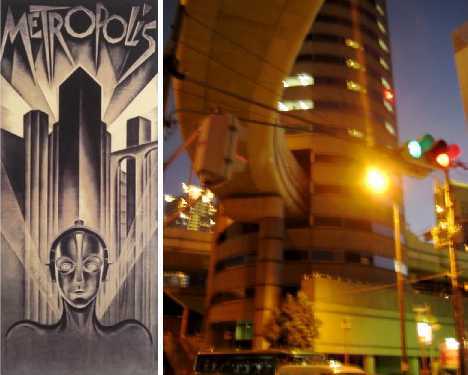 The Eighties were good times in Japan. Explosive growth in exports led by cars and consumer electronics left the government flush with funds to spend, and the preferred venue for spending was urban construction projects. 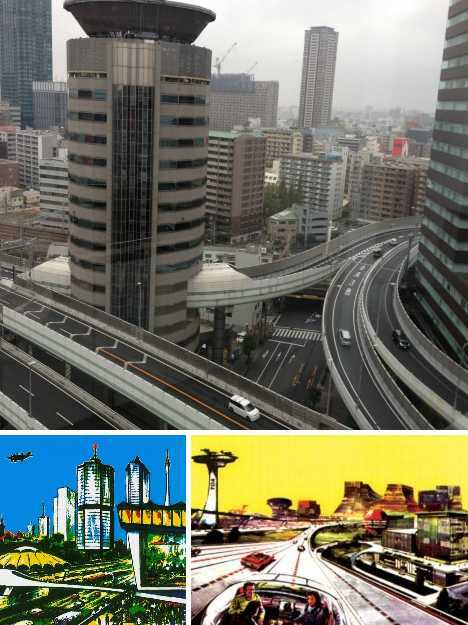 One such project involved the addition of several entry and exit ramps to the Hanshin Expressway, which itself opened in 1962 and has been branching out to serve the Osaka area’s growing population ever since. 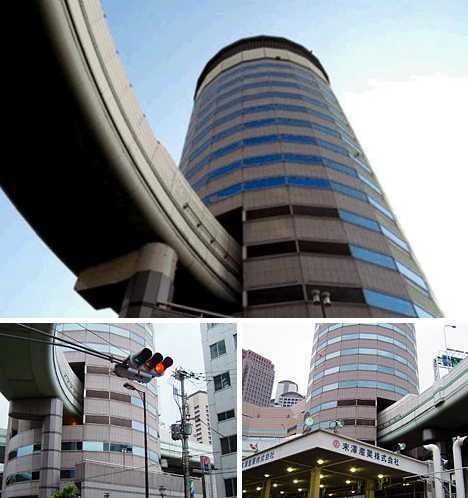 Though some sections of the Hanshin Expressway were severely damaged in the 1995 Great Hanshin Earthquake, the Gate Tower Building was unaffected. 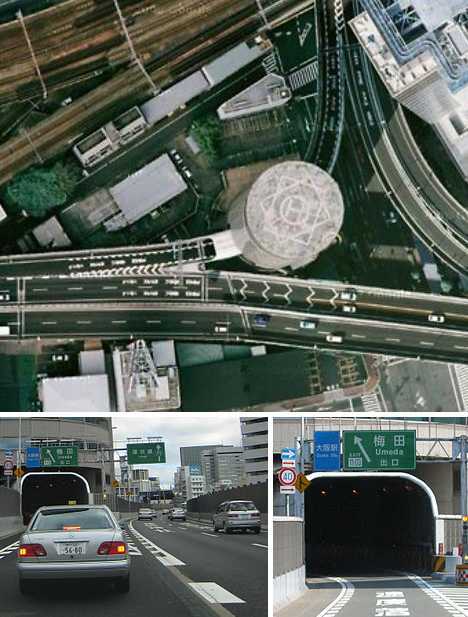 The ink on the blueprints wasn’t yet dry when a problem surfaced: the small yet crucial slice of downtown land destined to support the Umeda exit ramp was owned (since the 1870s) by a moribund lumber & charcoal firm, and the owners weren’t interested in selling the valuable property rights. Since there was no room to shift the exit ramp, the two sides sat down and began to negotiate… and negotiate… and negotiate some more. Five years later, the issue was finally resolved though neither side really conceded anything. 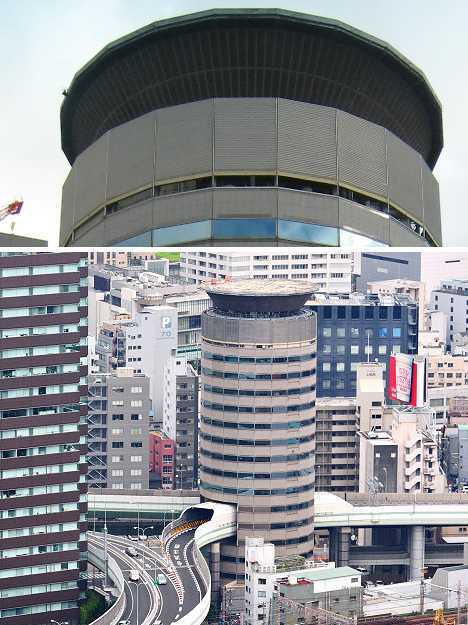 In 1988, the charcoal company’s last few mouldering buildings had been demolished and the property rights holders’ plans for a new, modern office tower had finally been approved by the Osaka city planning commission. Building permits previously rejected due to the need to construct the highway ramp got the go-ahead, and construction on the ramp itself began. Both projects had to proceed in sync since both projects would be proceeding on the same plot of land. And so the Gate Tower Building was born, though on first glance the structure appears not quite whole… in other words, it has a hole: right where floors 5, 6 and 7 should be. It’s unknown whether the original building plans called for the 16-story tower that opened in 1992 or a 13-story building unmarred by the highway ramp but that’s all irrelevant now. 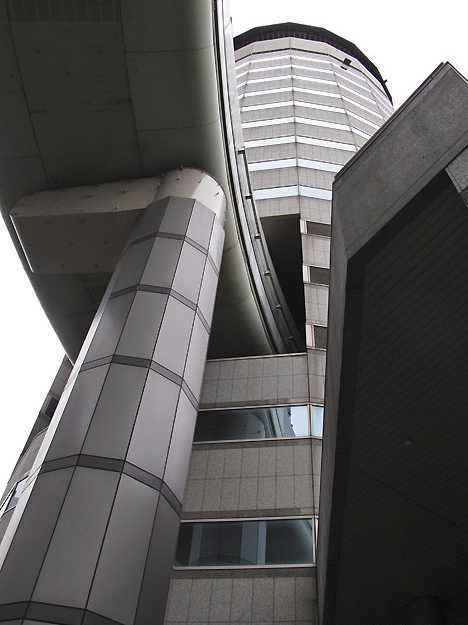 Workers in the Gate Tower Building don’t really notice the Umeda exit ramp as they toil away at the desks, with the possible exception of a slightly longer elevator ride up or down. The elevators are mounted on the tower’s exterior for practical reasons and the cars (both elevator and vehicular) bypass floors 5 through 7. 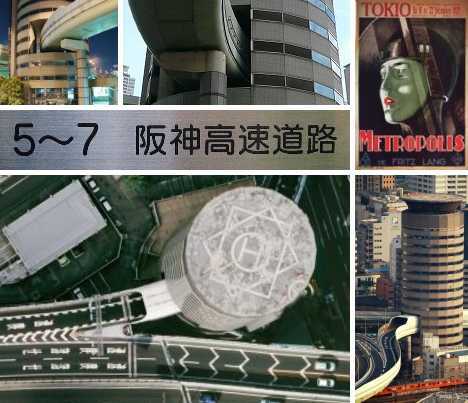 The nameplates for the omitted floors reads simply “Hanshin Expressway”. 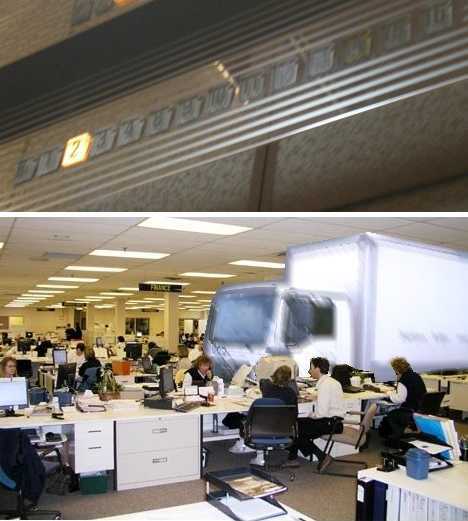 Surreal perhaps, but unarguably true nonetheless… and really, you don’t want to get off on one of those floors anyways, amiright? 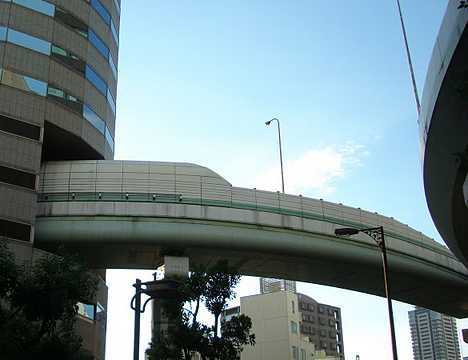 Suezawa Sangyo Co. Ltd. (the building owners) weren’t the only party to make some small compromises to accommodate the Umeda ramp. 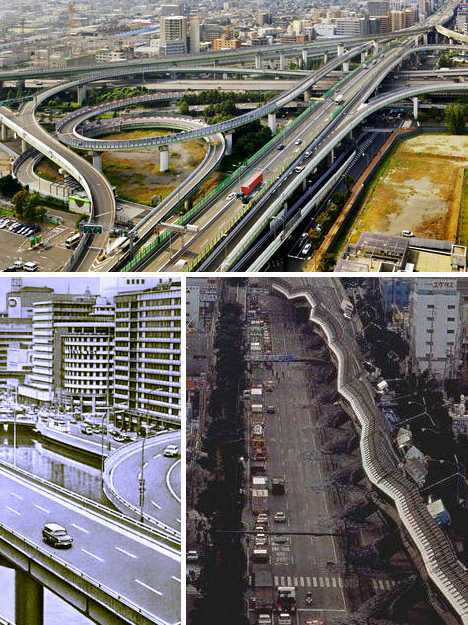 The Hanshin Expressway Corporation was required to insulate the building from noise and vibration, a feat that was accomplished in several ways. 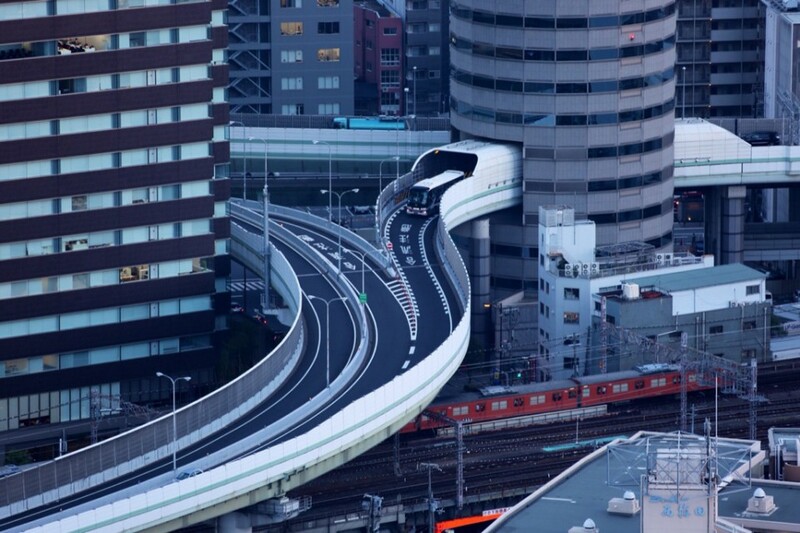 For one thing, the ramp is self-supporting and is designed as a bridge with its weight resting upon pillars. It’s interesting to note the pillars nearest the building (above) nicely complement the tower’s faceted facade. Secondly, the ramp’s “dogleg” bend and about a dozen meters of ramp on either side of the building are wrapped in a sort of “muffler” that, well, muffles the sounds of vehicles. 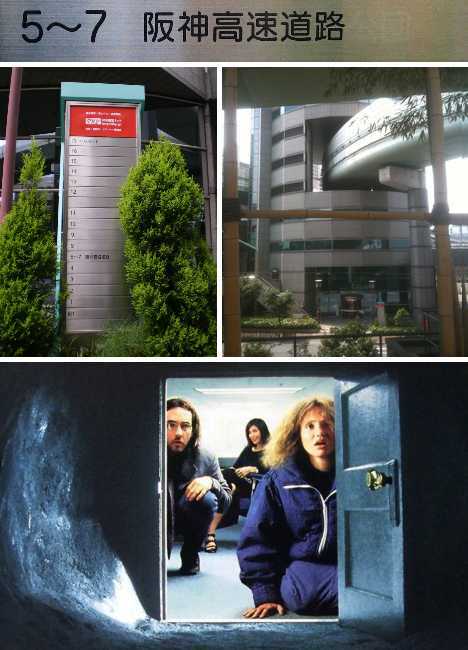 Wonders of 1980s construction aside, we can assume that workers on the Gate Tower Building’s 4th and 8th floors may note the odd shake, rattle & roll once in a while – and they know better than to chalk it up to just another minor earthquake. Those ensconced up on the 16th floor should hardly feel smug, however, as the building features a helipad on its roof. 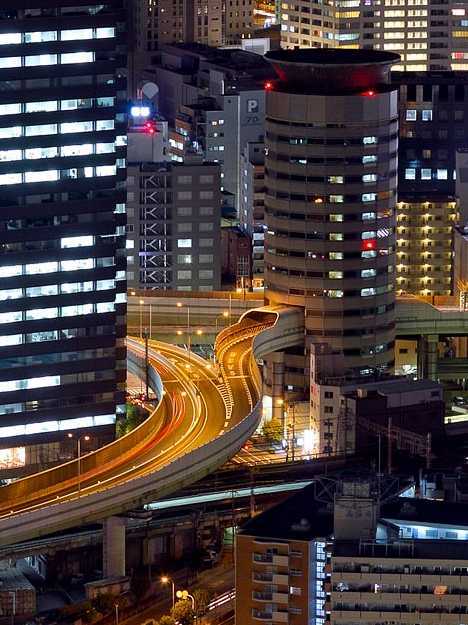 The Gate Tower Building is a shining example of Japan’s urban engineering skills, determination to solve potentially intractable problems and above all, desire to reach consensus regardless of the time and trouble required to do so. 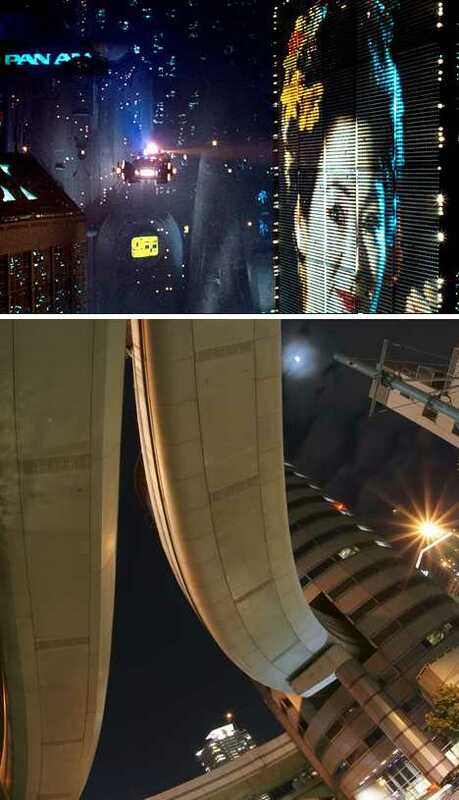 As for the Gate Tower Building itself, it may look super-cool and be a nice place to visit… but would you really want to work there?